A tremendously successful and popular little car, the Type 37 was introduced as a durable and easy to work on racer to supplement Bugatti`s sophisticated and complex Grand Prix cars. Type 37s were successful in the Voiturette class (under 1500cc), and their 1496cc plain bearing coil ignition motors were much easier to maintain than Bugatti`s full-on GP offerings. 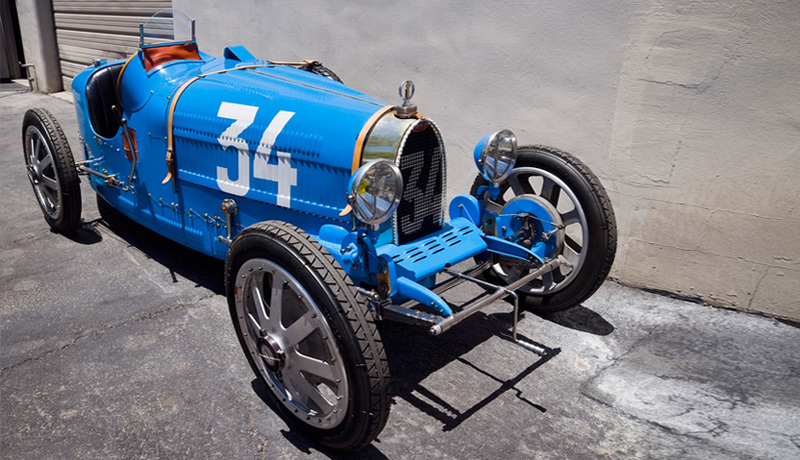 This particular car is a painstakingly recreated example that uses Bugatti Club parts, and as such, every component has passed their scrutiny and would be accepted as a correct replacement part for use on an original Type 37. To certify that the car meets their standards, the Bugatti Owners Club has granted this car a BC serial number. Based on its authenticity, the car should be a welcome entrant for prestigious rally events including the California Mille, and it has also been confirmed with the Federation International de l`Automobile that that the car is eligible for FIA papers (in Appendix K, whose phrasing we can pass along to interested parties). As a race car, this car will be sold on a Bill of Sale only. The car has incredible presence and is likely the finest recreation of any car we have ever had the pleasure to offer. It was built by Dave Willis, and every detail is just so, from the square-headed fasteners with full safety wiring to the hand scraping etched patterns on the engine block and cylinder head. Despite the high level of the Pur Sang cars, this car is even more impressive and authentic. It was thoroughly gone over in 2002, which included a wide variety of odds and ends. The clutch was replaced, and the charging system serviced. The carburetor was also serviced, and a pair of Marchal headlamps sourced and installed at tremendous expense. The cooling system also received attention, and the tail section of the body refinished. The car also received a standard service, and various electricals. In 2004, the car was converted to electronic ignition and the fuel tank restored. All told, nearly $20,000 was spent during this period.